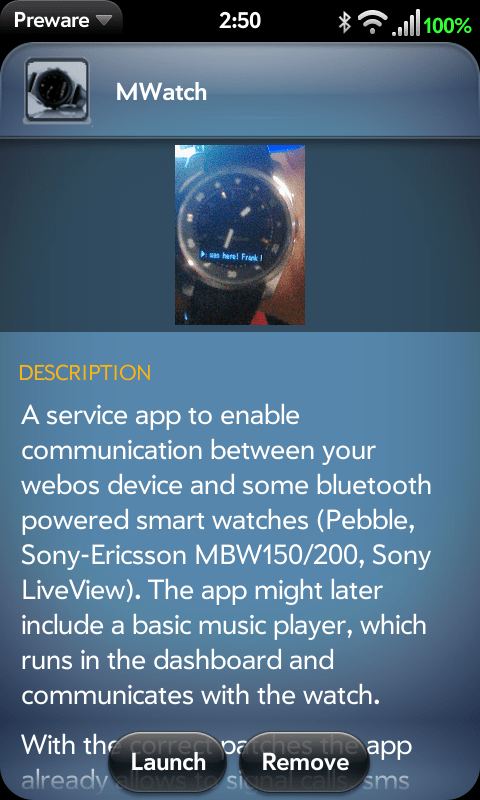 Thanks to MetaView, you can use your webOS 2.x phone with Pebble watches on firmware 3.x and below. Point your browser to the forums and grab the patch file. On your webOS 2.x phone open Preware and install MWatch. Use WOSQI to install the patch file. Grab this file to make each notifcation option toggle-able in Tweaks. Then copy the file to your device and use Internalz Pro to copy it to /media/cryptofs/apps/usr/palm/services/org.webosinternals.tweaks.prefs/preferences. If this is a brand new watch to you, you might need an Android or iOS device to get you set up before using it with webOS. 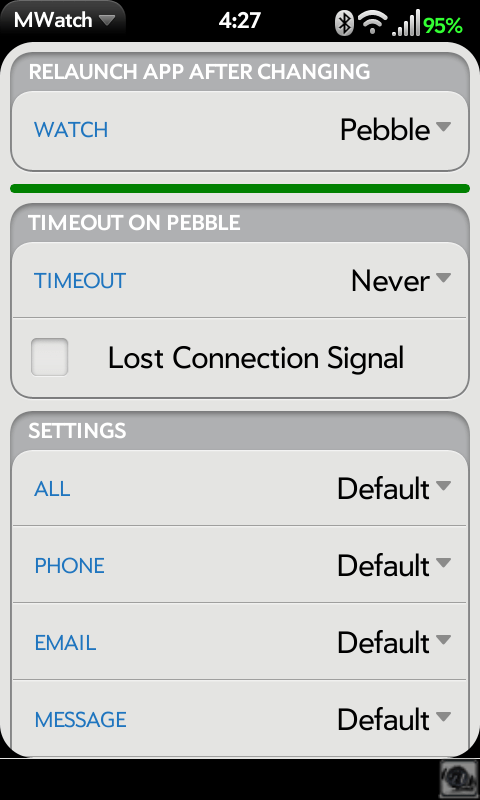 On the Pebble, hit the center button and then navigate to Settings > Bluetooth then leave it there. On the phone open bluetooth preferences and turn bluetooth on. Confirm on both the watch and the phone. Now simply open MWatch. You should see the red line turn green. Note: the mwatch service has to remain open. If you close it, it will reopen itself when you get a notification but it may not reconnect. If it ever has trouble reconnecting, try these steps. Tap on the MWatch notification icon and hit the red circle to ping the watch. Toggle bluetooth off and then on. 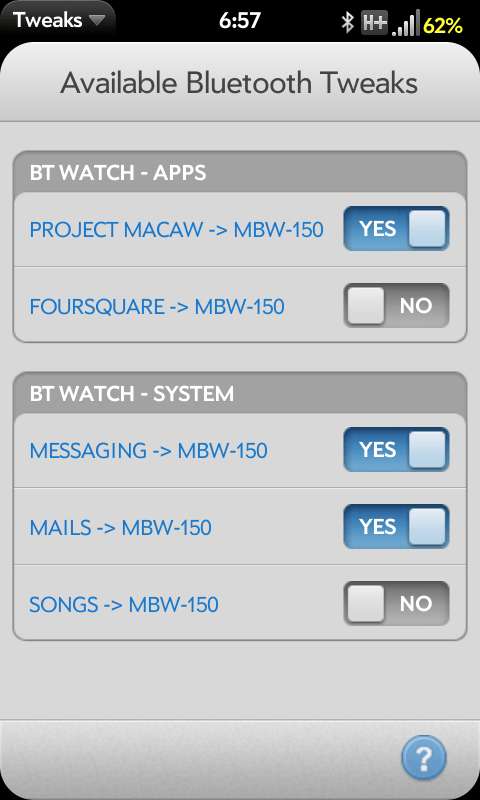 Swipe away the MWatch process from the notification area and close and reopen the app. Everything below works great IF you’re using a Pebble watch with PebbleOS 3.x or below, yes, even on the Pebble models released after the Pebble Steel. If you have an Android or iOS phone laying around, you can install different watch faces. The Pebble stores an unknown amount of watchfaces on the device but I doubt more than 3 or so. If you’re looking for a cool watchface for webOS…well I know one pretty awesome one that looks a lot better on the color Pebble Time (3rd gen) but not so much on the black and white Pebble and Steel. Check out Grabber’s (Matt) webOS watchface! Link if you’re on Android/iOS and have the Pebble app installed. Get Tweaks from Preware if you don’t have it already. If you chose to grab and copy over the .json file from the top section then you can open up the Tweaks app and pick your toggles. Calls can’t be toggled. Don’t forget to Luna restart after you’ve made your selections. In the event MetaView can update the app to support 4.x firmware, we’ll update. Talk about it or get support here.